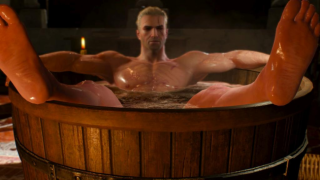 Meet the team, ask questions, find out how Bathtub Geralt happened. The very last panel at the PC Gamer Weekender in London this Sunday, 18 February at 16.00 on the Developer Stage, will feature the PC Gamer UK team answering your questions. Join Samuel Roberts, Philippa Warr, Phil Savage and Tom Senior, who'll reveal the origins of the blessed image you see above in public for the first time (we might've talked about it once on the UK podcast before)! So come along and hang out with us. It'll be super casual, and a really good chance to share your thoughts on PC gaming as it is now, or to hear yet more jokes about the time we gave Dragon Age 2 94%. The Weekender is happening on Saturday and Sunday this week at the London Olympia—you can still save 20% on tickets with the code PCG. If you're wondering what other panels we'll have at the Weekender, check out this list. It includes Creative Assembly, Rare, X-Com creator Julian Gollop, Firaxis and tons more. See you there!